OCZ today announced the latest addition to the award-winning OCZ NVIDIA SLI certified series, the world’s first 4GB PC2-8000 SLI-Ready DDR2 modules. Optimized specifically for the nForce platforms, this series features an ideal combination of reduced latencies and high density to support the ultimate gaming experience. The PC2-8000 SLI-Ready Series are certified to run at optimal performance levels and are the ultimate upgrade for entry-level enthusiasts seeking an exceptional memory kit with true “plug and play” functionality at an excellent price point. The OCZ PC2-8000 4GB SLI-Ready Series is the optimal memory solution for current and upcoming DirectX 10 graphic-intensive PC titles and provides unsurpassed reliability and performance to unleash every graphic possibility. The new high-density OCZ PC2-8000 4GB SLI-Ready Series is equipped with Nvidia Enhanced Performance Profiles (EPP) to optimize the modules’ gaming performance on nForce SLI-based motherboards. Sunnyvale, CA—July 8, 2008—OCZ Technology Group, Inc., a worldwide leader in innovative ultra-high performance and high reliability memory, today announced the latest addition to the award-winning OCZ NVIDIA® SLI™ certified series, the world’s first 4GB PC2-8000 SLI-Ready DDR2 modules. Optimized specifically for the nForce platforms, this series features an ideal combination of reduced latencies and high density to support the ultimate gaming experience. The PC2-8000 SLI-Ready Series are certified to run at optimal performance levels and are the ultimate upgrade for entry-level enthusiasts seeking an exceptional memory kit with true “plug and play” functionality at an excellent price point. The OCZ PC2-8000 4GB SLI-Ready Series is the optimal memory solution for current and upcoming DirectX® 10 graphic-intensive PC titles and provides unsurpassed reliability and performance to unleash every graphic possibility. For enthusiasts, gamers, and system-builders using Windows® Vista™ as their choice operating system and who need the performance of high-speed memory, these newest PC2-8000 4GB Kits are the ultimate SLI certified memory upgrade to increase your system responsiveness. The new high-density OCZ PC2-8000 4GB SLI-Ready Series is equipped with NVIDIA Enhanced Performance Profiles (EPP) to optimize the modules’ gaming performance on nForce® SLI-based motherboards. 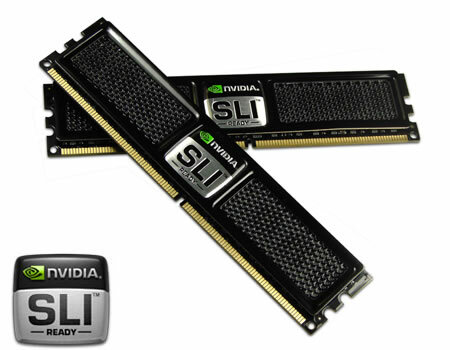 As part of the NVIDIA SLI technology ecosystem, these modules undergo a rigorous series of tests by NVIDIA and are certified to provide enthusiasts and gamers the performance, compatibility, and stability they seek when building an SLI gaming system. Tailored specifically for the NVIDIA gamer, each OCZ 4GB PC2-8000 certified memory kit features the exclusive black SLI-Ready XTC (Xtreme Thermal Convection) heatspreader for the most efficient heat dissipation, and a look that stands out like its performance. OCZ PC2-8000 4GB SLI-Ready memory modules are programmed to boot at a blistering 1GHz DDR2 with tight timings of 5-4-4 on Intel chipsets and 5-5-4 on AMD based systems. Only motherboards equipped with the custom-designed BIOS, such as those designed for NVIDIA nForce SLI MCPs, can detect the optimized SPD profiles and ensure the memory functions under the best possible conditions. The exclusive OCZ SPD specifications take out the guesswork and provide enthusiasts and gamers with significant overclocked performance with no manual adjustment or compatibility issues. Additionally, all SLI-Ready memory is backed with toll-free technical support, the exclusive EVP (Extended Voltage Protection) coverage, and an industry leading Lifetime Warranty. With the fusion of the sophisticated EPP memory specification, high-speed OCZ DDR2 architecture, the PC2-8000 4GB SLI kits are the ultimate breakthrough for advanced SLI platform gaming performance.